As an author, I want a diverse bookselling community. As much as online sales, I want the opportunity in brick and mortar stores to make connections with my readers, face-to-face, sharing stories and answering questions about writing. Absolutely nothing takes the place of conversation and community found in a little store smelling of books, musty, new and otherwise. I have been very lucky to have had this opportunity. As a child growing up on Philadelphia's Main Line, I remember the little corner bookstore just off Lancaster Ave. in Wayne. One particular Saturday, Dad took me into the store. I was eight years old and my father let me pick out any new book I wanted. My eye was immediately drawn to a hardback book with a beautifully illustrated cover in pale yellow and green. A funny little bear with protruding tummy stood with hands on hips. It was, of course, The World of Pooh by A.A. Milne. I particularly cherish the memory of being in that store and sitting in a cushioned window seat with a view of mottled beige and white tulip poplar trees gracing sidewalks near the train station. I thumbed through the book, entranced with the illustrations and stories. Later, when Dad and I got home, he inscribed it for me in beautiful blue ink. While the future may be eBooks, there is little doubt that independent publishing . . . writers taking control of their books (largely trade paperbacks) in terms of how they want them priced and packaged, illustrated and designed, is also the future. Hardback books are slowly going the way of the landline and coffeetable books gather dust on 65 percent off discounted tables. The economy and ease of storing books on eReaders are undeniable. All of us know independent authors; many are living among us in the community. We are the people who find the time to establish relationships and share stories and observations with our readers and other writers. For this reason, the independent bookstore is our lifeline . . . and for those stores who grasp the undeniable value of establishing community, authors are their lifeline, as well. By offering signings and talks, we bring people from our neighborhoods, schools, churches and civic organizations into their stores. Recently, I wrote a small tribute to Wellington Square, an independent bookstore here in Chester County, Pennsylvania and home to the Women's Writing Circle. How many times had I heard, "I had no idea this bookstore was here until this morning!" There is synergy. We give back to each other. 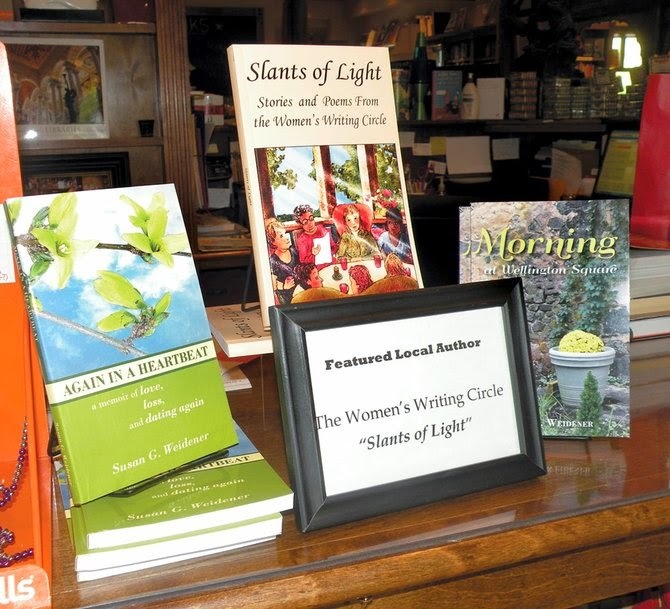 Our Women's Writing Circle has also held signings at Baldwin's Book Barn, and Open Mic nights at Chester County Book Company and Wellington Square. Authors are a quirky bunch and more than sales, we primarily want our books to be out there, to offer a reading, to make connections over coffee, conversation and the written word. It is a sad state of affairs that the large chain bookstores and big box stores that sell books, often shun signings by independent authors or refuse to stock their books. The impersonality of these stores would benefit from what the independent bookstore already cherishes. They foster a community's cultural identity within their walls. In this recent article by Porter Anderson "Is Amazon Really in Retreat?" he references a story in Shelf Awareness, which covers book retailing. It is about an Amazon executive who tried to build Amazon's own publishing efforts by bringing in bestselling authors under the Amazon imprint, but failed due in large part because "Barnes and Noble and indies refused to stock Amazon published works. You can order a print copy of the Amazon books via BN.com but no physical store would carry these books including the non traditional but big accounts like Walmart or Target." As a creative person writing and editing stories and leading a writing group, I prefer not to dwell on the fact that publishing is a cutthroat business . . . yet it is hard to ignore what is going on and wonder how this came to be or where it is all leading. I think back on that small bookstore in Wayne where Dad and I browsed shelves brimming with books of all stripes, stories and colors. I think about Winnie-the-Pooh. He called himself a "bear of very little brain." He had no pretensions, no expectations, he just lived for sharing the simple joys with friends. Yet he was a wiser philosopher and stauncher friend than most. I think there's a lesson there.